Elefante Rock is between the beaches of Itacoatiara (in the municipality of Niterói) and Itaipuaçu (in the municipality of Maricá). It is 412m above sea level and the highest peak of the park and of the city of Niterói. It is the most famous and crowded hill in the entire region, because, in addition to the spectacular view from the top, the access road provides all kinds of situations, being a very interesting path. You may walk on a well-marked trail under beautiful specimens of the Atlantic rainforest, across observation decks with beautiful landscapes and, in order to reach the final part, you will need to make (easy) climbing moves and also to climb and walk past some rocks and roots with a little exposure, so those who are not used to this kind of situation might feel “butterflies” in the stomach. The name “Elefante Rock” is the most popular due to the design of its outline, when seen from Itaipuaçu Beach, resembling an elephant. 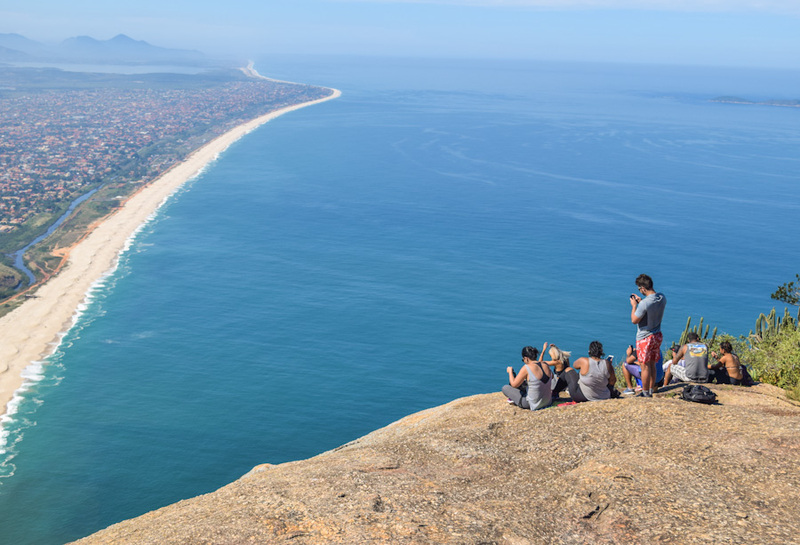 Other known names are, as follows: Fake Sugar Loaf and Itaipuaçu Rock, besides the one with historical support, Alto Mourão, named after Duarte Martins Mourão, the owner of these lands in the mid-16th century. The trail begins at the highest peak of the short hill (Gilberto Carvalho Road), 150m high, about 50m before reaching Itaipuaçu Observation Deck, and is marked with signs. Follow up the south slope in a well-marked trail, with few obstacles, and cross an area under recovery in this initial section. After walking 600m up for about 20 minutes, the slope is less steep, the trail meets a clearing with rocks called Descanso Square (or, originally, Pita Square). After that, the trail remains relatively flat and with a slight rise and fall.